On Saturday 24 Oct. Elaine and I noted 53 species on Lesser Yangshan and at Nanhui. The most notable birds on Lesser Yangshan were Eurasian Wryneck, Hair-crested Drongo, and Hawfinch. 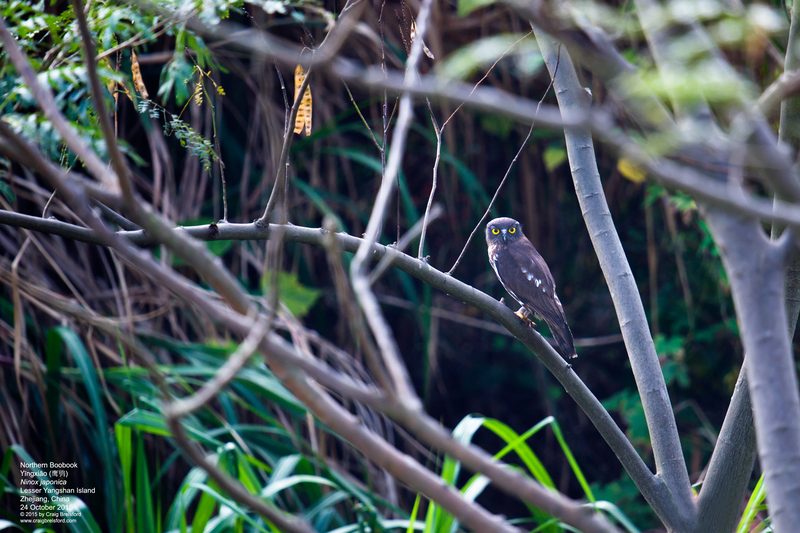 We saw a “flock” of 3 Northern Boobook. At Nanhui, Eurasian Woodcock was found in the microforests along the sea wall. Brown-headed Thrush and Red-throated Thrush are uncommon passage migrants in the Shanghai region. Once again, our team consisted of Michael Grunwell, Stephan Popp and wife Xueping, and Elaine and me. The moment with the woodcock was team birding at its best. Walking along the road atop the sea wall, I stumbled upon the woodcock. It exploded from cover and left the forest. I immediately knew I had scared a brown non-thrush, but I hadn’t seen the long bill. “Brown bird!” I cried out. The woodcock appeared from behind a line of trees just long enough for Michael to see it. “Woodcock!” he cried out. 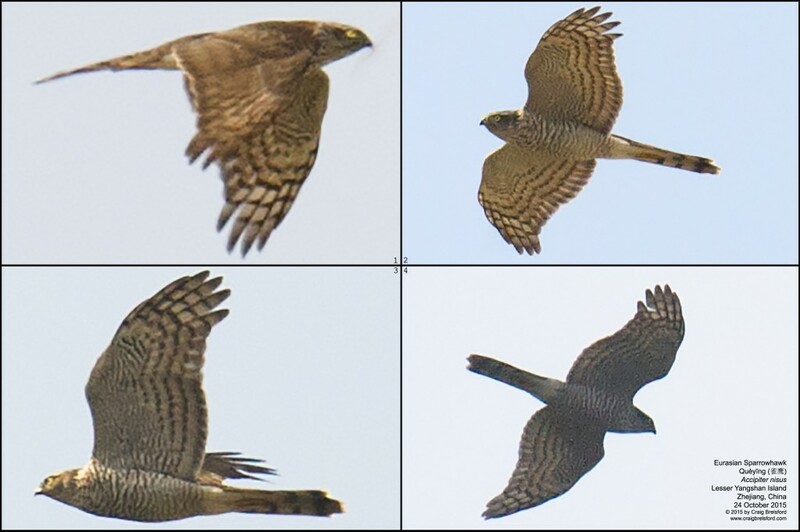 This migrating Eurasian Sparrowhawk appeared briefly over Lesser Yangshan. A China tick for Michael! Weather: Hazy and warm, with a steady northeasterly wind. High 25°C. Lesser Yangshan Island (Xiǎo Yángshān [小洋山]), island in Hangzhou Bay, Zhejiang, China. List includes birds noted at Garbage Dump Gully (30.641565, 122.062836), Garbage Dump Coastal Plain (30.638860, 122.060089), Xiǎoyánglíng Cove (30.642243, 122.066940), & Temple Mount (30.639945, 122.048277). 07:00-11:50. Northern Boobook on Temple Mount, Lesser Yangshan. Ninox japonica is a regularly noted passage migrant in Shanghai. Around Pudong Nanhui Dongtan Wetland (Pǔdōng Nánhuì Dōngtān Shīdì [浦东南汇东滩湿地]), Shanghai, China (30.920507, 121.973159); list includes birds found at Magic Parking Lot (30.882784, 121.972782). 12:30-15:45. 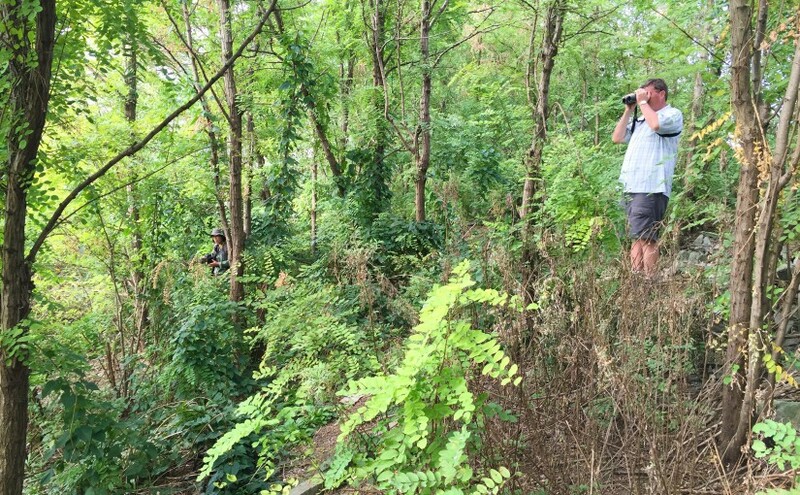 Featured image: Xueping Popp (L) and Michael Grunwell (R) in one of the microforests on landward side of the levee at Nanhui. During migration season, these plantations of locust trees contain an astonishing number of woodland birds.